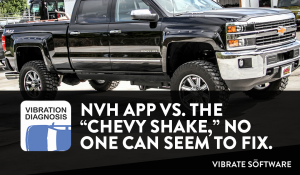 The NVH App Vs. The Chevy Shake No One Could Fix - Vibrate Software, Inc.
Nobody can seem to fix the vibrations on these vehicles. I have been personally involved in diagnosing two vehicles that were purchased back from the customers for this very problem. The first vehicle is a 2014 GMC Denali 1500 Series 4X4 Crew Cab short bed pickup truck. The second is a 2015 Cadillac Escalade 4X4 SUV. Both of these vehicles had the EXACT SAME CAUSE of the vibration; a rear axle that was not setup correctly. In the spring of 2016 I was teaching a manual drivetrain class at the university at which I teach. As part of that class we always go through the complete inspection, disassembly, repair, and assembly process of a rear axle. We had 3 vehicles on the hoists and 5 axles on the workbenches. I love to work on vehicles with real problems, so I gathered my students around the 2015 Cadillac Escalade 4X4 on the hoist and told them about the vibration problem that resulted in the buyback of this vehicle. I told them we would carefully inspect the 9.75” rear axle as we disassembled it to see if the rear axle had any troubles that may have contributed to the vibration. Using the same diagnostic procedure outlined in our new NVH smartphone app, one of the very first steps you should perform when diagnosing and disassembling a rear axle is to measure what is known as the “Total Turning Preload” of all the bearings that hold the ring and pinion gear set in place inside the axle housing. This measurement should be done at the pinion nut with the driveshaft, wheels and tires, and brake rotors removed. Using a flexible beam type or dial type inch-pound torque wrench, a technician should rotate the pinion nut and see what the constant rotational torque (effort) is. Typically the measurement will be at least 15-25 inch-pounds on an axle that is setup properly, we measured ZERO! I could not believe it! the only time I had ever read anything close to zero inch-pounds of rotational torque was on a 35 year old severely worn axle with high mileage on it. This was a one year old Cadillac, how could this be? Next, we moved to the 2014 GMC Denali 1500 Series 4X4 Crew Cab short bed pickup truck and performed the same measurements. It also read ZERO inch-pounds of rotational torque for the “Total Turning Preload” measurement. The truck had the exact same rear axle housing except is had a 9.5” ring gear rather then the 9.75” ring gear in the Cadillac. Having two vehicles with zero bearing preload is absolutely unheard of, there must have been a problem with the axle setup, the lubricant, something was very wrong here from the factory. We replaced all the bearings and one ring and pinion gear set, setup the axle properly upon reassembly. We could not drive the vehicle on the road since they were donation vehicles to my school, but we did test them on the hoists, the vibrations were gone. Proper bearing preload on the ring and pinion gear set prevents the gears from moving vertically, horizontally, or diagonally as they rotate. Those gears like to push away from each other as you accelerate your vehicle, and pull together as you decelerate your vehicle. Any movement like that will cause the gear backlash to become too small and have the gears bind with each other at they try to rotate. The ring gear rotates at tire speed and will mimic a tire speed related vibration. the tires had been balanced many times on this vehicle in an attempt to repair this problem, obviously it would not fix it. The pinion gear rotates the same speed at the driveshaft and will mimic a driveshaft vibration. I know that several good technicians worked on these vehicles as well as an “expert” GM “Field Service Engineer”, nobody could find they problem or fix the vehicle. Admittedly I cannot prove that this fixed the “Chevy Shake” problem that both of these vehicle were experiencing because I could not road test them, but I am positive we fixed the source of two terrible vibrations on both of these vehicles. See my detailed rear axle diagnostic and repair video series by clicking HERE. All of the axle diagnostic information included in this video series is included in the NVH app. There were many bad parts on these vehicles, but nobody detected them. Two very unhappy customers were the result. Thousands of dollars were wasted on attempted repairs, many hours of labor were wasted because nobody really knew how to diagnose a vibration problem; they were just guessing! The NVH app eliminates the guesswork in vibration diagnosis and guides you step-by-step through the entire diagnostic and repair procedure. Get the NVH app today by clicking on the link below.